This year the Catholic Church celebrates the 100-year anniversary of the Marian apparitions at Fatima, Portugal, witnessed by three shepherd children who reported that they saw visions of Mary beginning on May 13, 1917. Whatever the significance of the Fatima apparitions is for each us personally, this 100-year anniversary of the apparitions is a reminder of the central message of the Gospels, calling everyone to conversion and bringing us closer to Christ. 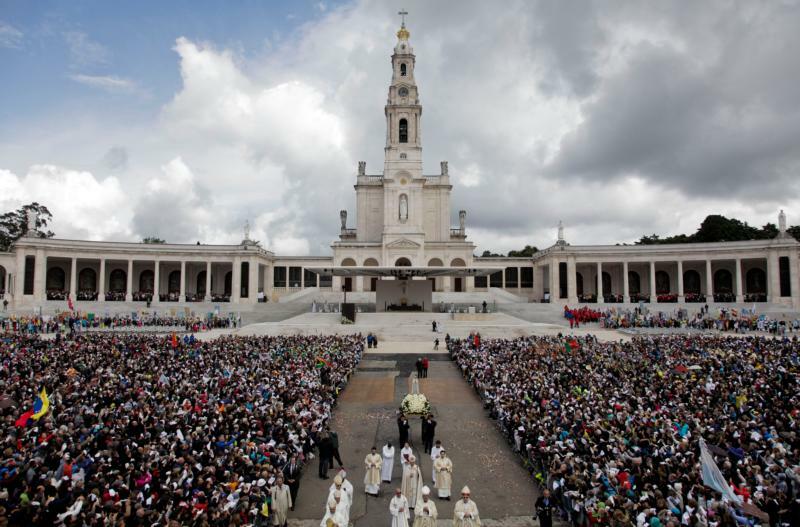 Explore this package of resources on the Fatima centenary observance from our partner Catholic News Service. The apparitions of Mary at Fatima, witnessed by three shepherd children, began on May 13, 1917 and then again on the 13th day of five subsequent months. They were declared “worthy of belief” in 1930. Catholics in America maintain a strong devotion to Mary under the title of Our Lady of Fatima because she and the dearly departed pray for us and help us follow the Gospel. Because we do not comprehend fully the love of God for us personally, watch what He does for us on the 100th Anniversary of His love in sending her to us. Includes yourself. There is a strain of Marian devotion that substitutes surrender to Mary for direct surrender to Jesus. Surrender directly to Jesus open us up to His Spirit which was poured out at Pentecost. Does surrender to Mary open us up to her spirit?